Josh Donaldson, a 32-year-old former MVP, will be looking for a job this winter. This MLB offseason, star players searching for contracts like Bryce Harper and Manny Machado are going to be fine. But the majority of free agents in baseball this winter? They might be in store for another long wait as the game continues to trend younger — younger than it’s ever been for position players in the free agency era. Harper and Machado — rare 26-year-old superstar free agents — could break contract records this year. (Harper has already turned down $300 million.) But the rest of the free-agent class of 2018-19, which was once expected to be historically rich in talent, is not as strong as it could have been. Dodgers ace Clayton Kershaw declined to exercise his opt-out and signed a new three-year, $93 million deal with the Dodgers on Friday without ever becoming a free agent. Josh Donaldson, the 2015 American League MVP, suffered a series of injuries that diminished his value, and A.J. Pollock has a similar recent history. Andrew McCutchen, a former National League MVP, is now 32 and no longer a star-level player. While there is star power at the top, more money to spend and perhaps fewer rebuilding teams, the vast majority of this class’s 250-plus free agents — who became eligible to sign with any team on Saturday — face the same questions that tormented the middle tier of free agents last year: Will any team sign them? And even if they land on major league rosters, how long will they have to wait, and what kind of salary will they have to accept to get there? The overriding issue is that the game is getting younger. Last season was the youngest for position players since the 1970s. To become a free agent, a player must accrue six years of service time.1 The average age for rookies breaking into the majors last year was 24.4 for position players and 25.3 for pitchers. By the time these players have six years of service time, most will be at least 30 years old. Harper and Machado, who debuted as 19- and 20-year-old wunderkinds, are outliers. According to Spotrac, the 147 free agents to sign at least a one-year deal with guaranteed dollars last season were, on average, 32.6 years old, and the average age of this year’s class is 33.1 years. 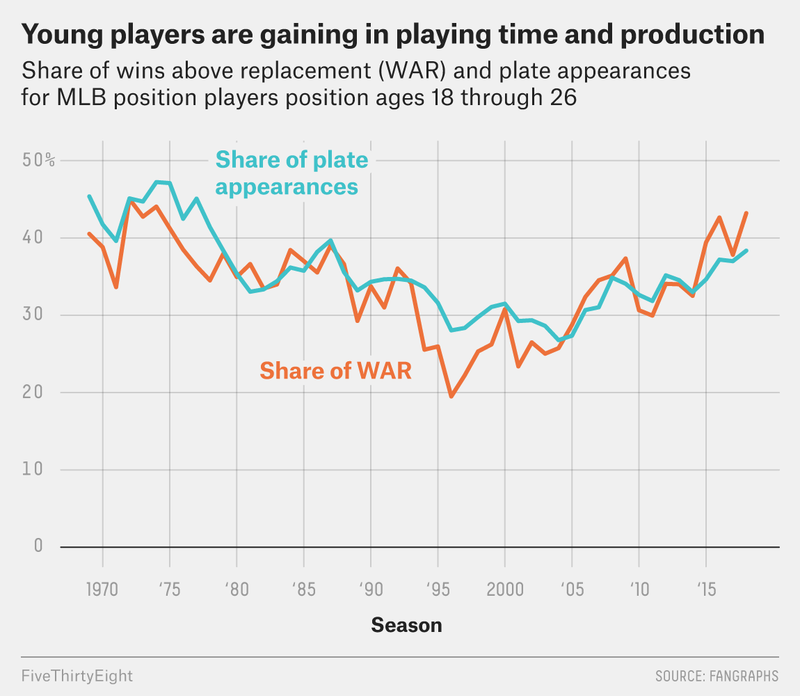 Last season, position players age 32 and older accounted for 12.9 percent of wins above replacement (WAR)2 and 18.6 percent of plate appearances, which were the lowest numbers that demographic have contributed since 1975 and 1979, respectively. Free agency began in MLB after the 1976 season, so last offseason’s landscape for 30-somethings was about as bleak as it’s ever been in the free agency era. And this past season featured position players who were even younger. Meanwhile, younger players continue to be productive — and gain more playing time. Position players 26 and younger accounted for 43.2 percent of position-player WAR in 2018, the highest share since 1974, up nearly 20 percentage points from 2001 (23.4 percent). Similarly, this group got 38.4 percent of plate appearances, which was the highest number for them since 1987. Pitchers are also trending younger, though not as dramatically. Pitchers age 32 and older combined for 18.7 percent of WAR and 19.9 percent of innings in 2018, which is down from 2001 levels (27.1 and 24.9 percent) but up from the 21st-century low in 2015 (12.1 and 17.1 percent). David Freese — who hit .296 with a .359 on-base mark last season — was ostensibly so concerned about his prospects this winter that, rather than test the open market, the 35-year-old signed a one-year, $4.5 million deal with the Dodgers last week that was less than his 2019 club option of $6 million. (The Dodgers also paid him the option’s $500,000 buyout.) Some background: Freese waited until March 11, 2016, to sign a one-year, $3 million deal coming off a 2.2-WAR 2015 season. Freese is well-aware of how tough the market can be for a 30-something free agent. There was a time not long ago when a player with Walker’s resume wouldn’t have to worry about finding work. Not now, though. The Pittsburgh Pirates, Walker’s former club, proved you could achieve mediocrity without spending a single dollar on a major league free agent last offseason. The players union went as far as filing a grievance against the Pirates — along with the Miami Marlins, Tampa Bay Rays and Oakland A’s — for spending very little on their major league payrolls while also being among the clubs receiving revenue sharing. There are a number of other issues contributing to the game’s youth movement, including testing for performance-enhancing drugs and teams’ growing desire to manage budgets more efficiently. The average position player age reached this century’s peak — 29.3 years — in 2004, when PED usage had become so rampant that the league finally enacted penalties for testing positive. That age has been declining ever since and fell to 28.1 last season, suggesting that PEDs may have been artificially extending the productive lifespan of a significant number of older players. 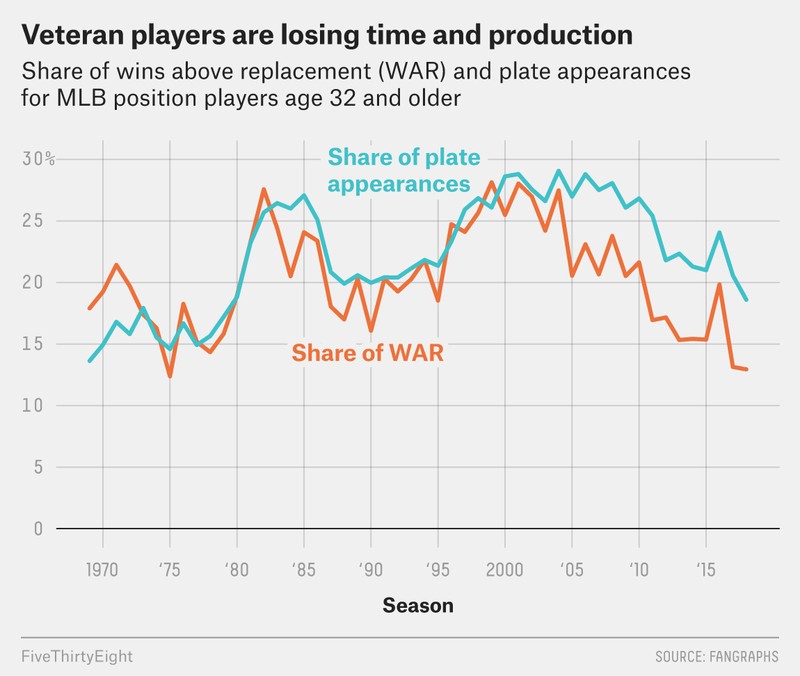 Furthermore, last season position players age 32 and up saw their plate appearances decline by 36 percent compared with 2001, but their WAR production dropped by 54 percent. In other words, older players have become less effective in the playing time they get. Younger players are also usually cheaper — until they reach arbitration after three seasons in the majors, players make at or near the league minimum salary. Players who haven’t yet hit free agency also don’t come with the kind of high-risk long-term contracts that teams seem increasingly leery of — and not without reason. For instance, Eric Hosmer was a relatively young free agent last winter, entering his age 28 season, when he signed an eight-year, $144 million deal with the San Diego Padres. Hosmer proceeded to turn in a below-replacement-level performance for the year (-0.1 WAR). FanGraphs’ top 10 free agents last winter included some successes — J.D. Martinez and Lorenzo Cain — and some failures in Hosmer and Yu Darvish.4 Overall, the top 10 FanGraphs free agents combined to produce 20.5 WAR at $179 million in earnings in 2018. That’s $8.7 million per WAR for a club, which is not particularly efficient. Indians pitcher Trevor Bauer also believes that younger players have another advantage: They are better adapted to recent technology advances and have benefited from improved player-development practices. But while more older players are aging out of the game and teams are avoiding risky, big-ticket contracts, free agency is also being pinched on the front end. Teams have increasingly manipulated players’ service time, delaying their entry into free agency. Kris Bryant filed a grievance against the Chicago Cubs in 2015 over this. Last year, Vladimir Guerrero Jr. hit .402 in Double-A and .336 in Triple-A, but the Blue Jays didn’t bring up the 19-year-old because they claimed that he needed to work on his defense, and the son of a Hall of Famer has yet to debut. Guerrero and the MLBPA filed a grievance. Moreover, teams have had success at hanging on to many young stars by offering club-friendly extensions before they reach free agency, buying out those first years when a player can test the open market. And in recent offseasons, an unusual number of teams have been mired in dramatic rebuilds, with no interest in adding to their payroll. In September, things had gotten so dire for the Baltimore Orioles and Kansas City Royals that we questioned whether they could even beat Triple-A teams. And while baseball officially has no salary limits, MLB’s strengthened luxury tax acted as a soft cap last winter. Only the Red Sox and Nationals exceeded the $197 million threshold in 2018, according to numbers obtained from the commissioner’s office by The Associated Press. The Yankees stayed under the luxury tax for the first time since it was implemented, and the Los Angeles Dodgers spent just $4 million on free agents last winter. Perhaps that was done with an eye on this year’s class and on courting Harper, Machado or other stars. Time will tell. At a time when baseball revenues have increased dramatically — the average franchise valuation increased from $295 million in 2004 to $1.6 billion in 2018, according to Forbes — total money spent on player salaries increased by just 1.86 percent from 2017 ($4.638 billion) to 2018 ($4.724 billion). Some have wondered whether baseball players would actually benefit from a salary cap if it also came with a salary floor that guaranteed players a share of the sport’s revenues. After briefly instituting a salary cap and replacing arbitration with restricted free agency during the 1994-95 strike, owners would likely reject such a proposal today. Tinkerers have put forward other ideas to help improve free agency for players, including declaring all players free agents when they reach a certain age, which would also address the way clubs have been manipulating service time. For now, they are just ideas. “As we approach the next round of collective bargaining, we’re going to be considering all aspects of the system, as we always do,” the MLBPA spokesperson said. But there are several actual developments that could help players this winter. The Marlins spent last offseason trading off significant assets like Christian Yelich, Giancarlo Stanton and Marcell Ozuna, which had the trickle-down effect of allowing several teams to fill the holes in their roster without resorting to the free-agent market. This time around, the Marlins don’t have many assets to shed, though catcher J.T. Realmuto could be dealt. There don’t appear to be many teams with major assets to sell, though the Seattle Mariners might rebuild. In addition, large-market clubs like the Yankees and Dodgers reset their tax status last winter, which means that the next time they exceed the threshold, their tax rate will be lower. Since so many teams were rebuilding last year, maybe some of them will be past the teardown stage and more interested in upgrading their rosters this year. The Chicago White Sox and Atlanta Braves, for example, may begin to spend more significantly and build on their cores. The Philadelphia Phillies are rumored to be interested in Harper and Machado. The Toronto Blue Jays, Minnesota Twins, Houston Astros, San Francisco Giants and even the Tampa Bay Rays are projected to enjoy considerable payroll space. The stars will certainly get paid this offseason, but the game also continues to trend younger. That means it could be another long winter for the majority of free agents. Players also become free agents when they’re released from their clubs before reaching that threshold. According to FanGraphs’ version of the metric. Walker hit .219 last year, so perhaps teams saw something that made them rightfully cautious. Granted, this was just the first year of the players’ multi-year deals, so these assessments may change by the time the contracts end.